AURORA, Colo. — An Aurora man who drives one of the most popular cars on Colorado roads is frustrated after learning a potentially deadly airbag problem will take months to get fixed. Last week, Pete Sense received an urgent recall notice regarding his 2012 Subaru Outback. 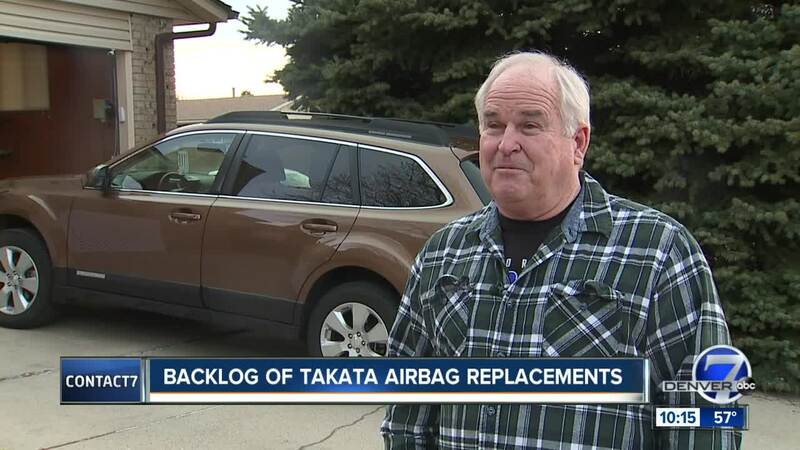 The notice said his passenger side Takata airbag was being recalled because of a potentially deadly flaw but was told he'd have to wait until August to get it replaced because of a backlog of parts. Sense and his wife moved to Colorado from Arizona. Because the Subaru is the only car with snow tires, Sense drives his three grandchildren in the car, which includes a car seat for a 1-year-old. "It could explode. It could cause death. I don't want to do that to my grandkids," said Sense. He went to a local Subaru dealership to get the problem fixed. The service department told him they couldn't work on the car for five months because of a nationwide backlog on parts. They're trying to service 8,000 cars with similar problems. He called Subaru and spoke to a woman who gave him a similar story. Several other automakers are also facing the recalls. "I'm sure there are thousands of other people, maybe thousands in Colorado, that are facing a similar situation," said Sense. Meanwhile, he is driving his other car. He's hoping the snow has ended and he and his family can afford to give their Subaru a five-month vacation. "I figure it'll be parked until August, then we'll get the parts, and it'll be ready to go next winter,” he said. The local Subaru dealership said if Sense is truly concerned about his family's safety they can squeeze him in immediately. Sense replied he doesn't want to take the place of a family that only has one car, so he's prepared to wait until August.